The HTC Vive is now more affordable than ever. This is thanks to HTC knocking $200 off of the price of the consumer version of its VR headset. Price cuts are a sure sign that the virtual reality market is evolving Why Virtual Reality Technology Will Blow Your Mind in 5 Years Why Virtual Reality Technology Will Blow Your Mind in 5 Years The future of virtual reality includes head, eye and expression tracking, simulated touch, and much more. These amazing technologies will be available to you in 5 years or less. Read More , with the cost of entry coming down as interest in the technology goes up. Anyone over a certain age will remember previous attempts at making virtual reality a thing. All of which ended in failure. However, the technology is now catching up to the ambition, and VR is becoming a serious business. Which is why so many big-name companies are getting involved. One of those big-name companies is HTC, which is responsible for the Vive VR headset. This particular VR headset is so impressive that we gave it 10 out of 10 in our review of the HTC Vive. Sure, it’s more expensive than the Oculus Rift, but our own James Bruce loves it regardless. Now, HTC has knocked $200 off of the price of the Vive, bringing the PC-based consumer version down to just $599. This brings the Vive closer to the $499 list price of the Oculus Rift. However, Facebook temporarily reduced the price of the Oculus Rift to $399 You Can Now Buy an Oculus Rift for Just $399 You Can Now Buy an Oculus Rift for Just $399 The Oculus Rift VR headset is now more affordable than ever. This is thanks to the Facebook-owned Oculus VR temporarily reducing the price of the Rift plus Touch controllers. Read More over the summer. The HTC Vive’s new $599 price tag is permanent. HTC hopes that by lowering the price of entry, more people will buy a Vive, and some of the accessories to go with it. HTC also throws in a free trial to Viveport Subscription, which lets you play a handful of VR titles every month. It’s no coincidence that this new price point has kicked in just prior to the start of the holiday season. The virtual reality market is maturing slowly but surely, but the price is still a significant barrier to entry. Especially if you have to upgrade your PC first The Best PCs for Virtual Reality The Best PCs for Virtual Reality We've heard about the Oculus Rift for a long time now. 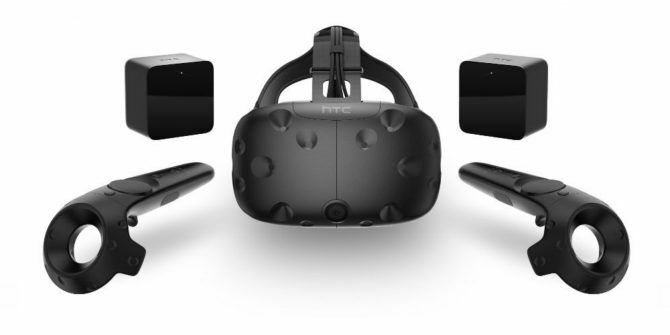 HTC teamed up with Steam VR, creating the HTC Vive virtual reality headset. But what's the best PC to power them? Read More . Do you have any interest in virtual reality? Do you think it’s the future of everything? Or just a fad that’s likely to fizzle out? Do you own an HTC Vive? Or an Oculus Rift? Or have you opted for the PlayStation VR instead? Please let us know in the comments below! Explore more about: HTC, HTC Vive, Virtual Reality.